Printers have been awfully boring necessities over the years. For far too long, they were big, clunky boxes that would sit on a desk and do one thing all day long: print. Whether it was your next great novel or pictures of the kids, the printers were always there, ready to do the print job you needed. But along the way, all-in-one printers have gained in both notoriety and appeal. The devices come with the ability to print, of course, but also toss in scanning capabilities and the option to copy your documents for safe keeping. And depending on what you buy, there is often also an option to send e-mails directly from the printer to a recipient’s inbox. Several companies that have been making printers for years, like HP, Epson, and Canon, among others, all make solid all-in-one printers. And although they come with plenty of compelling features, many of the options those companies sell are often times affordable. We’ve compiled the following list of the five best all-in-one printers that are both affordable and would work well for most people. We’ve chosen them based on their collection of features, value for the price, and critics reviews. We’ve also analyzed user reviews to ensure those who have actually used the printers liked them. Epson has long been a major player in the printer market. And its all-in-one Expression Home XP-440 is one of the top options on the market. The device comes with a sleek, black design that can be placed anywhere in the home without detracting too much from the décor. It comes with the ability to wirelessly connect to your smartphone, tablet, or computer over Wi-Fi, and will even print from a memory card. And since it has separate cartridges for each major ink color, you’ll only need to replace one at a time. In addition to photo and text printing, the Epson Expression comes with both scanning and copying capabilities. And with help from a handy color screen on the device, you can quickly see what’s about to be scanned, copied, or printed before you start an action. The Epson Expression Home XP-440 is a solid device to have in the home. And at $50, it’s nicely affordable. Canon is perhaps best known for its efforts in the photography business, but it’s also a major player in printers. 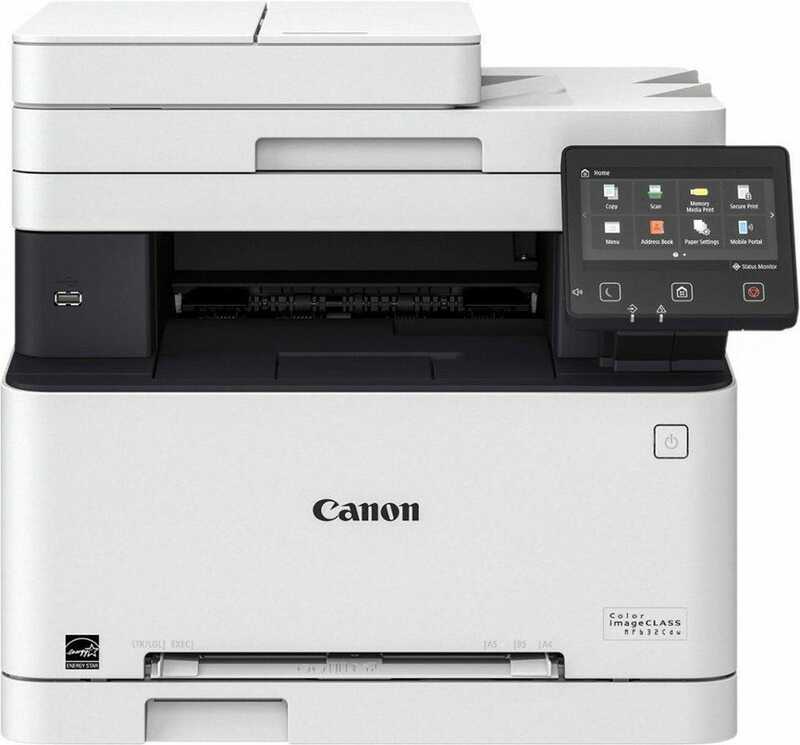 The Canon Color ImageClass MF632CDW is a high-end printer that will set you back $220. For that, you’ll get a device that uses laser printing, which allows you to print a whopping 19 pages per minute. Better yet, the laser printer has support for up to 1200dpi, which means whatever you print will look downright fantastic. And if you want to print wirelessly from your devices, the Canon ImageClass will let you do it. In addition to printing, the ImageClass comes with support for both scanning and copying. And its handy 5-inch LCD will allow you to quickly access menus and see what you’re doing on the device before you start printing or scanning. And since it comes with an oversized paper tray, you’ll be able to store 250 sheets of paper in the device at any given time. Brother is another popular printer maker that has made a name for itself by bundling a host of features into devices that don’t necessarily break the bank. Indeed, the company’s MFC-L3770CDW aims at doing just that. The printer comes with a bulky design that’s made to work for you both in the home and the office. Better yet, it comes with four functions — printing, scanning, copying, and faxing. And with help from its 50-sheet automatic document feeder, you can engage in multipage single-pass duplex copying and scanning to get big jobs done far more quickly. It’ll even print 25 pages per minute. To make the printer more versatile, Brother includes a special-use tray that can accommodate printing on a variety of paper types, including envelopes, card stock, and more. And since it comes with both built-in Wi-Fi and near-field communication (NFC) support, you can wirelessly print with ease. There’s even a 3.7-inch color touch screen on the printer to help you quickly navigate its software. 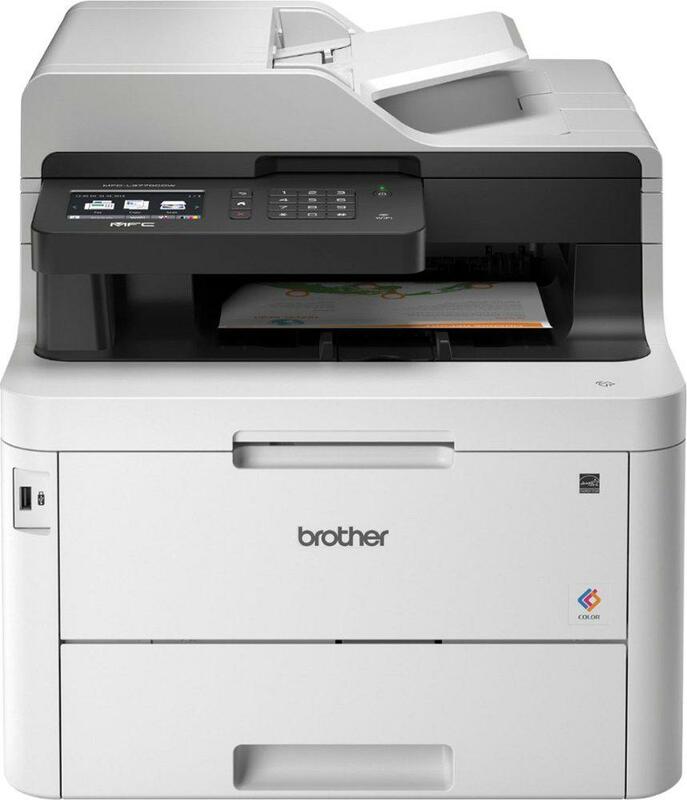 Brother’s MFC-L3770CDW is available now for $350. Whether it’s for home or office use, if you want a device that can dramatically improve your printing, scanning, and copying efforts, the HP LaserJet Pro MFP M521dn might be the place to start. 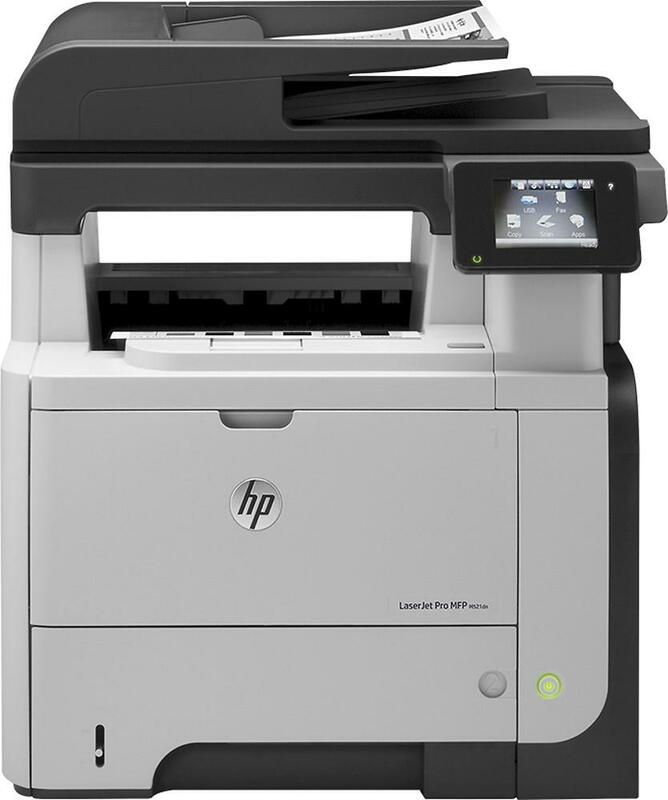 The HP LaserJet is actually a four-in-one machine that includes the ability to print, scan, copy, and fax. It uses LaserJet technology to dramatically enhance its performance and can print 42 pages per minute. To get network printing, you can plug in a network cable into the printer and if you’re looking for better-looking printed images, you can rest assured knowing the device can print at 1200 x 1200 dpi. HP’s printer is capable of printing on a variety of different paper types, including standard size and index cards, and comes with a 3.5-inch touch screen that allows you to quickly work your way through menus, choose your printing or copying mode, and more. And since it comes with fax support, you can send 59-page faxes in as little as six seconds. The HP printer works well with text and photos. At $900, the HP LaserJet Pro might seem expensive. But it delivers outstanding value for the price. Epson is back with a higher-end all-in-one printer called the Epson Workforce Pro WF-4740. The printer is a four-in-one that comes with printing, faxing, scanning, and copying. It supports duplexing and fast printing, as well as PrecisionCore ink technology that improves the quality of your prints without sacrificing speed. And to improve ease-of-use, the printer is capable of printing documents via Gigabit Ethernet or via Wi-Fi so you can print from a variety of devices wirelessly. Epson’s printer can print at up to 24 pages per minute and offers an impressive 4800 x 1200 dpi color resolution. There’s also a 4.3-inch color LCD touchscreen for quickly sifting through modes and getting the printer to spit out documents. 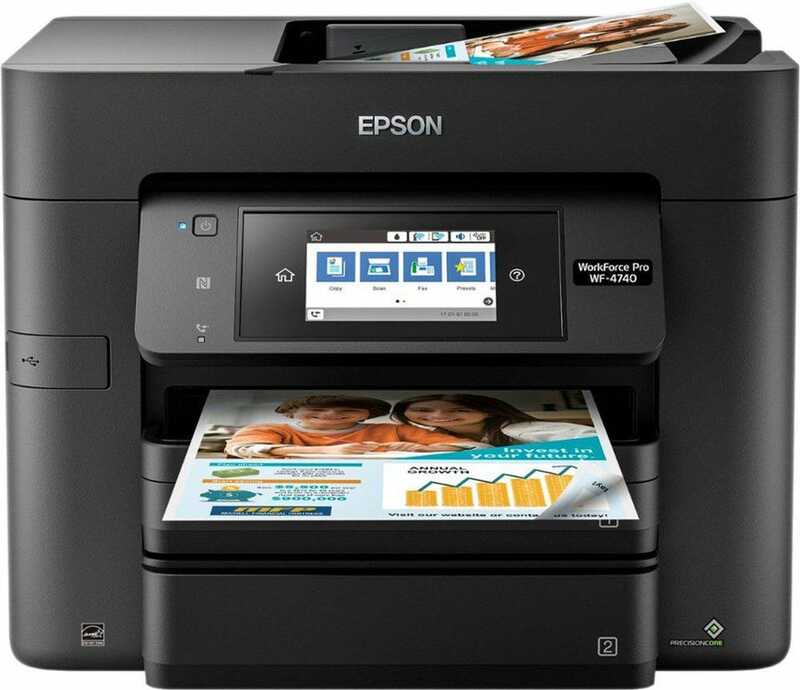 According to Epson, the printer is designed for both home and small business use.